other forest management activities we need to do on these lands. Long-term planning helps ensure that state forest management activities meet statewide goals for ecological protection, timber production, and cultural/recreational values. The DNR assembles teams from the Divisions of Forestry, Fish & Wildlife, and Ecological & Water Resources who work with partners and the public to write the plans. The DNR invites feedback at various points in the planning process through webinars, surveys, and open comment periods. What are Section Forest Resource Management Plans? Forest Management Plans guide vegetation management on timber-producing state forest lands. 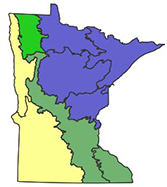 Plan coverage areas are determined by natural boundaries based on the Ecological Classification System (ECS) which classifies Minnesota's forested landscape into geographic units based on local geology and ecology. Each plan covers one ecological Section. There are seven forested Sections in Minnesota. The plans establish forest management direction for nearly 5 million acres of state-managed land administered by the divisions of Forestry and Fish & Wildlife. DNR revises these forest management plans on a scheduled basis. See our Plan Updates page for information on the timing of upcoming plan revisions. Why do we make plans? Planning allows the DNR to strategically and sustainably manage state forestland over time. Each plan identifies several components that help determine strategic direction. These components are based on available natural resource data for the region, DNR policy, legislative rules, and input from other forest planning efforts (see "Other planning efforts" below). Issues: Natural resource concerns that affect (or are affected by) the management decisions made on timber-producing state forestlands. Examples include forest age and composition, biological diversity, and sustainable harvest levels. General Direction Statements (GDSs): Broad directions for management (e.g. increase, decrease, or maintain certain forest conditions). Strategies: Specific steps that will move forests in the desired general direction. Desired Forest Composition (DFCs): Short-term (10 years) and long-term (50 years) desired changes to DNR forestlands within the planning area. The planning process identifies which forest stands will likely be treated over the 10-year period. Potential management treatments include various types of timber harvest actions, thinning, forest regeneration, prescribed burning, and corrections to forest stand inventory information. Forest stands are selected for the 10-year list based on age; site productivity; size, number, and species of trees; and forest stand location. Forest stands selected for the 10-year list will be field-visited by DNR staff over the planning period to determine the appropriate management actions for each forest stand, considering identified plan strategies and goals. The plans are made with the best available knowledge at the time, and in alignment with existing state and agency policy. However, the process and the plans themselves must be flexible in order to adapt to new information and changing conditions. The planning process provides for periodic reviews to monitor plan implementation and determine if plans need to be updated. The Minnesota Forest Resources Council (MFRC) creates 10-year Landscape Plans meant to provide forest resource management guidance across all ownerships within the planning areas (which are similar in scope to planning areas). Landscape Plans have been completed for most forested parts of the state. It is important that DNR planning teams consider the role that state forestlands play in achieving the broader MFRC regional landscape goals. The DNR invites public involvement throughout the planning process. Review the forest management planning process for information on where these opportunities fall in the overall planning timeline. All forest management plan webinars and planning documents are available online. Paper copies are available upon request.